Calling all App Inventor developers! Have you developed a new, unique app using App Inventor? Submit it to App of the Month! What is App of the Month? 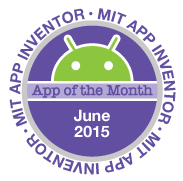 App of the Month is a program where App Inventors can submit their apps to be reviewed by members of the MIT App Inventor team. We will give badges to the developers of our favorite apps and showcase them on our website! Inventors of all ages are welcome to submit apps in any language! Apps must be made in App Inventor and must be functional. How do I submit my app? Fill out this form. Submit your app by the 15th of the month for consideration for the next month. If you miss the deadline, don't worry! Your submission will be considered in the subsequent month. Best Design: The app that is the most aesthetically pleasing. Most Innovative: The app that uses App Inventor technology in the most interesting/unique way. Most Creative: The app that best uses creative elements such as art, color, sound, or movement. App Inventor of the Month: An App Inventor who demonstrates great potential and creativity. All winners will receive a digital badge that they can display on their social media sites! See the awesome apps from previous App of the Month winners!